« Layoffs at @CineplexDigital ? So, in the end there was no IPO for Gimbal. 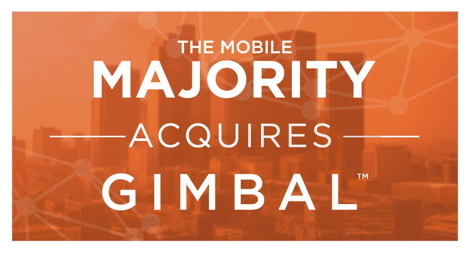 Breaking news now is that The Mobile Majority, a data monetization and mobile media execution solution has acquired Gimbal. Gimbal of course was ‘incubated’ inside Qualcomm Incorporated, starting back in April 2010 and began developing two new emerging mobile businesses and products: a geofencing and contextual awareness platform and a secure BLE beacon solution. In June 2012, the enterprise-grade SDK was released, and Gimbal was established as a private company in mid-2014. Last year, it looked very much as if Gimbal was all ready for an IPO but China and other economical factors effectively blocked that (and others in our industry). Gimbal went through some painful management changes and one wonders what sort of sale this was. Don Norton, The Mobile Majority’s GM of Channel Partnerships said “By combining resources with Gimbal, The Mobile Majority’s audience data allows partners to create custom audience networks and reach extension solutions beyond the scale and accuracy of the walled gardens – driven by incredibly sophisticated location infrastructure, data-driven behavioral insights, and deterministic identity matching”. For more information on the acquisition, Gimbal’s continuing operations, and The Mobile Majority’s new offerings you can click here. The Mobile Majority is based out of Santa Monica, California. It’s basically a mobile advertising solution that leverages a vertically-integrated technology stack built atop a sophisticated data infrastructure to enable advertisers, publishers, and media companies to serve the most efficient, effective, and targeted advertising in the world. This entry was posted on Monday, December 5th, 2016 at 17:27 @769 and is filed under DailyDOOH Update. You can follow any responses to this entry through the RSS 2.0 feed. You can leave a response, or trackback from your own site.